Pre-applied LOCTITE™ 204 adhesive activates upon installation and securely locks the insert in place. Inserts are “fastener-ready” 4-5 minutes after installation. Full cure is achieved in 72 hours. At full cure, LOCTITE™ seals against liquids and gases to 6,000 psi. LOCTITE™ 204 performs in temperatures to 300 degrees Fahrenheit. Breakaway torque is 280 in/lbs. Important: In order for the adhesive to perform properly, the tapped hole must be clean and dry. LOCTITE™ 204 works only in metal. 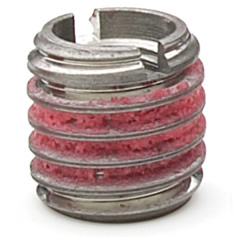 Installing an E-Z LOK™ (Solid Wall) threaded insert from metal in plastic or wood will not work. If desired, E-Z LOK™ (Solid Wall) inserts can be supplied without pre-applied adhesive, allowing you to apply whatever adhesive you would like to use prior to installation.